To preview your XML Document in the built-in Internet Explorer, select Tools > Preview in Output or press F10. You do not have to save the document before previewing the file in the built-in Internet explorer. 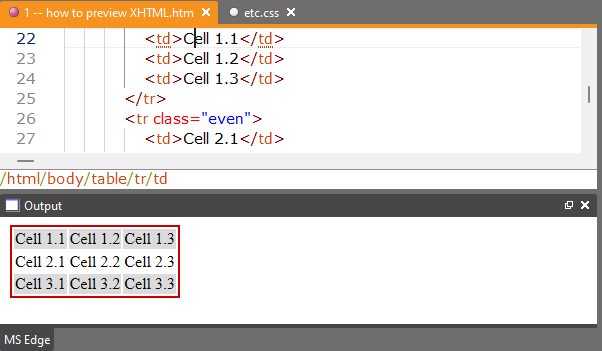 Select Tools > Preview in Default Browser or F6, if you want to preview your XML Document in an external HTML Browser. You have to save document before you can preview it in an external browser. To view SVG content in XMLBlueprint a plugin for Internet Explorer is needed, such as Adobe's free SVG Viewer. To download and install SVG Viewer, see http://www.adobe.com/svg/. To test if you have installed the latest version of SVG Viewer, see http://www.adobe.com/svg/viewer/install/svgtest.html. To access the SVG example files, open the Files view (View > Files), select Examples and open folder "Advanced > SVG". Follow the instructions. To view MathML content in XMLBlueprint a plugin is needed for Internet Explorer, such as Design Science's free MathPlayer. To download and install MathPlayer, see http://www.dessci.com/en/products/mathplayer/. To test if you have installed the latest version of MathPlayer, see http://www.dessci.com/en/products/mathplayer/check.htm. To access the MathML example files, open the Files view (View > Files), select Examples and open folder "Advanced > MathML". Follow the instructions.